Thank you for received browse.We are the altar building() at Takayama than 1909 (Takayama, Gifu Prefecture). Altar has been made by making full use of traditional craft techniques ranging in 7 steps.They are unique to Japan technology. 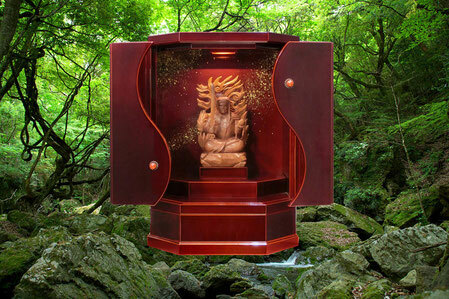 Please see the is also a symbol of Japanese culture altar. 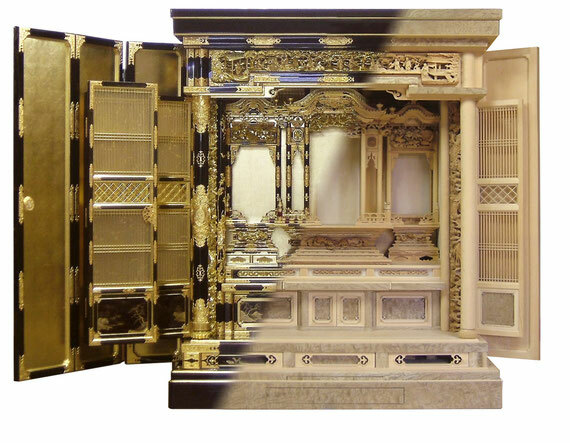 Was your altar to make that future generations to remain in the theme, it was produced a special your altar to commemorate the 100th year in 2008.Can be precisely because craftsman population, pheasants, sculpture, metal fittings, Gold lacquer luxury specification. Incorporating regret without the craftsmanship "series HIBIKI". Are not intended to be mass-produced, we believe that most thoughts to everyone of your ancestors, was fabricated wholeheartedly. The traditions gave birth craftsmanship, there are this craftsman who knows the Buddhist altar in Takayama. Only because alpine altar shop, gathered skills of its craftsmen, it is this "series HIBIKI" that is made in the land of Hida-Takayama. It is a small altar which applies the traditional craft-Hida Shunkei.Was motif the "jewels" that is said to bestow good luck avoiding the magic from ancient times. Why not decorate what you want to your hug?